Leading Manufacturer of hospital opd management software, hostel management software, institute management software, library management software, restaurant management pos software and retail management software from Ahmedabad. The OPD software module provides an electronic record keeping, data processing, and reporting/billing system within the OPD management practice and process followed by the hospitals during the entire treatment and care process of patients. It facilitates doctors to give better consultation and take quick decisions by providing comprehensive information of patient information. This OPD module equips doctors to check the details of all the patients with the facility to calculate the cost of all the services rendered to each patient and reflecting into the final billing accurately providing a smooth and transparent billing system. Packaging Details: - Hostel management simplified - Rooms and bed allocation made easy. - Complete Mess management. - Disciplinary log maintenance. - Setting up fees as per the facilities in the hostel - Hostel and mess fee integrated with fees management module for automated fee calculation. - Daily updates to parents on hostel attendance. - Real-Time reports. Day to day task of institutes is very much tough and time-consuming. 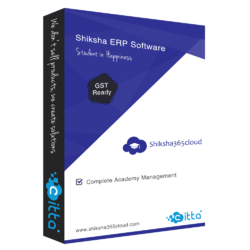 Shiksha365cloud education ERP software is for the comprehensive and effective management of educational institutes to the full range of education administration and academic functions. This application provides easy, accurate and timely retrieval of activity-oriented information through the menu is driven, user-friendly operations. This institute management system is designed to meet the information need of all level of management and department, helping them in planning, monitoring, and control of daily activities. Shiksha365cloud is a powerful Institute Management Software that provides advantages to everyone to achieve excellence in their areas. It is strategically important for management while teacher, parents, and students gain excellence by using it. Packaging Details: - Increased Library Engagement. - Simple & Easy to Use. - Efficient Cloud Data Management. - Highly Secure, Scalable & Reliable. - Dynamic Reports - Error-free - Innovation. - Real Time reports. - Fully Customizable. - Cost-effective. Anybody involved in restaurant management would know that the guest service doesn't end with order serving. The final and the most critical process for every food and beverage establishment is billing operations. Because this is the only thing that will leave a lasting impression on the guests. Streamlining all operations and keeping all the updates between orders in check, Foodie365cloud - restaurant POS manages the entire billing process-including adding removing items in an order, splitting bills and more- without any hiccups. Managers are often concerned where a leader stands in the sales cycle and what their salespersons are doing to push things forward. With a CRM system like Sales365cloud, in addition to getting better at tracking sales leads, you’ll be tracking the work done by all your team members. Our small business CRM keeps you informed round the clock! Club Management Software helps clubs track membership and loyalty. Additionally, users can track revenue targets, promotion programs, accounts, inventory and facility management, too. Thus, users can automate a host of mundane tasks and can enhance operational capabilities. In short, clubs can leverage this application to deliver premium service to their members and patrons. Packaging Details: - Enrollment and Admission Process are made easy. - Students and parents can search the course they are looking for with all the information on course curriculum. - Universal access with ease. - Allows student to look for jobs and placements and keep track on the changing trend in the job market. - Improves communication (Improve verbal communication) - Security of data and records. - Better Student Relation. - Real Time reports. hms365cloud is an advanced ERP solution developed especially for hospitals planning the next level of growth. The aptly selected modules of hms365cloud will bring in transparency and provide the management with actionable insights. The process changes and the industry best practices that the solution brings could enable certifications. Hms365cloud addresses requirements like multi-location operations, centralized data, security, collaboration, and mobility. Packaging Details: - Establish your hospital as technically advanced. - Streamlining of Patient¿¿¿s Appointments & Scheduling Process. - Processing Patients¿¿¿ Claims through Medical Billing Software. - Timely Automated Reminders to Patients for Vaccination. - Proper Management of Drug Inventory. - Better revenue management. - Improve data security. - Improved clinical decision-making. - Compatible with all platforms. Packaging Details: - Easier tracking of sales. - Compatible with all platforms. - Hassle-free processing of credit and debit card transactions. - Easier preparation of statements, such as profit and loss and tax. - Better tracking of inventory. - Tighter off-site control. - More effective use of human resources. - Easy prepration of financial statements. - Complete Orders Quickly.